Alfred E. Smith – the people’s politician? Alfred Emanuel “Al” Smith (1873-1944) grew up in the Fourth Ward of New York City’s Lower East Side. This map provides a snapshot of living conditions in the neighborhood approximately ten years before his birth. The wider electorate looked upon Smith as a “typical” New Yorker, and New Yorkers loved him for his humble origins. Smith rose through politics with the backing of the Tammany Hall political machine, sitting on the New York State Assembly and serving first as Sheriff of New York County and then as President of the Board of Aldermen, before going on to be elected governor of New York State four times between 1919 and 1928. Smith went on to run as the Democratic candidate for the United States presidency in 1928, losing to Herbert Hoover. When I first started looking at the documents in the Al Smith collection, I couldn’t quite believe that people had so much respect for a politician. I’m British; we don’t like our politicians very much. 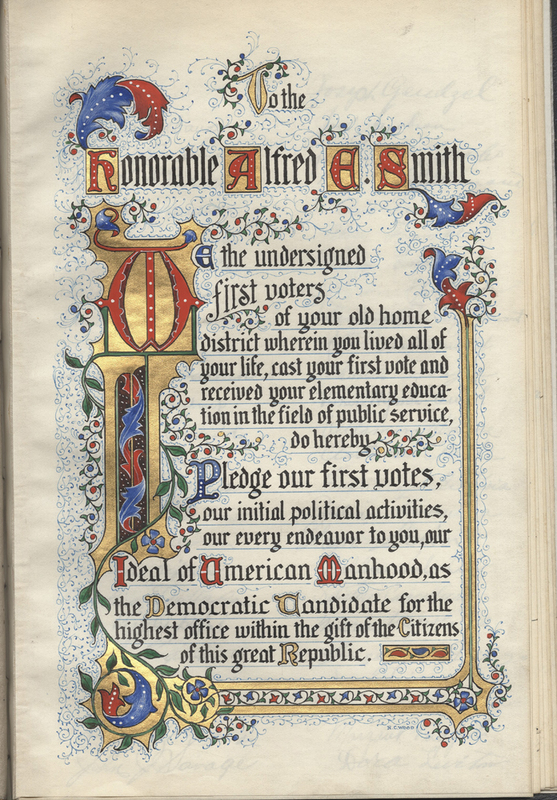 The collection, however, holds published articles in praise of Smith, an honorary doctorate from SUNY, and a booklet full of voter signatures in Smith’s home district pledging their support in the 1928 election. Other messages of support came from the Motion Picture Theatre Owners of America, and one of Smith’s former teachers. Could people really like a politician this much? When I began researching Smith, I discovered that, far from the one-sided view of him I feared I was getting, the collection is actually an accurate representation of how popular Smith really was, at least in New York City. It would be foolish to think he was universally loved: he was a Catholic, he was anti-Prohibition, and he was linked to Tammany Hall. He was progressive in his support for civil rights, women’s rights and worker’s rights – gaining him admirers as well as detractors – but he tried to follow a populist line and always maintained an image as a true working class New Yorker. Smith’s down to earth persona helped him win the race for Governor of New York in 1918. 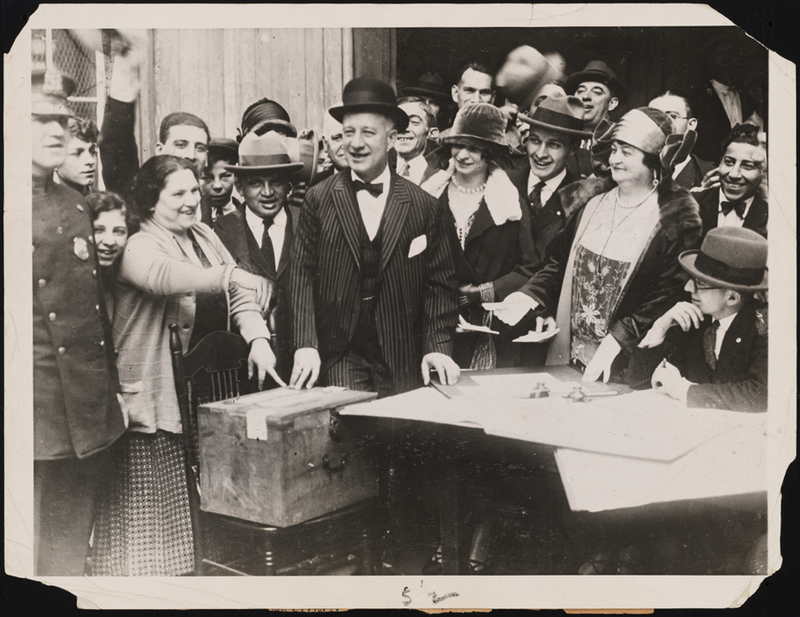 Although he lost the next election in 1920, he was successful in the 1922, 1924 and 1926 elections, choosing not to run in 1928 in order to run for the United States presidency. 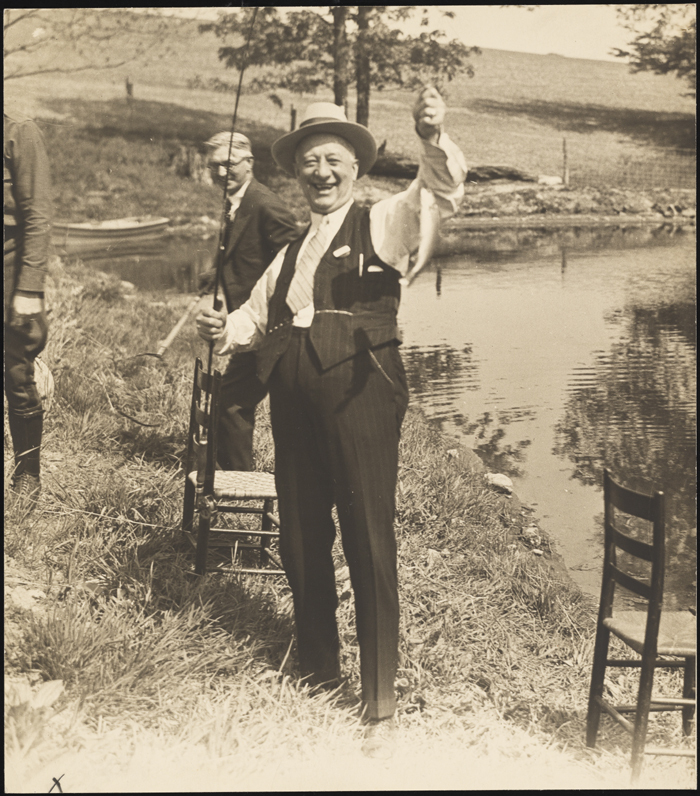 Running for president proved to be vastly different from running for governor, and Smith’s image worked against him in places that distrusted urbanites, despite the reality that, by 1928, Smith’s life in upstate New York looked more like that of a country gent than of a city slicker. Smith was also seen as having a limited view of the country’s issues; he had never traveled outside New York state before the election campaign, spoke with a heavy New York accent, and his Roman Catholic religion was attacked with abuse and slurs throughout the campaign, especially in the south. 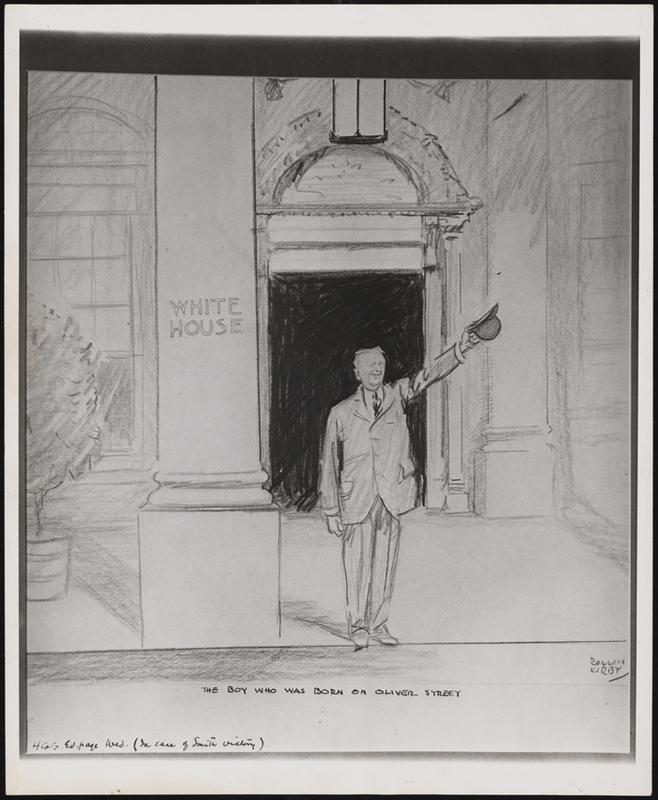 The 1928 Presidential election, though difficult to call during the campaign, resulted in a landslide victory for Hoover. After his devastating loss, Smith left politics behind and became president of Empire State, Inc., the organization that built the Empire State Building. He held this position until his death in 1944, never returning to the political stage. The collection contains documents that span Smith’s entire life, from playbills that document his childhood exploits in amateur dramatics at St. James’ School to his calendar notebook for 1945. Smith’s scrapbook, created around 1896, shows his early interest in politics: he pasted a number of newspaper clippings on New York political stories alongside playbills and invitations to events. 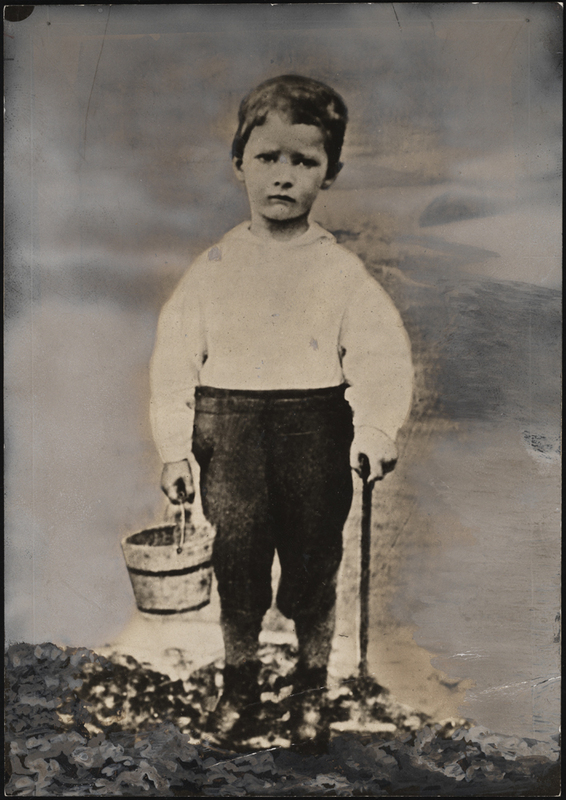 There are photographs showing him throughout his lifetime, from a picture of him taken at Coney Island, aged 4, to a shot of him surrounded by his children and grandchildren. There is even a memorial postage stamp in the collection, issued in Smith’s honor in 1945. 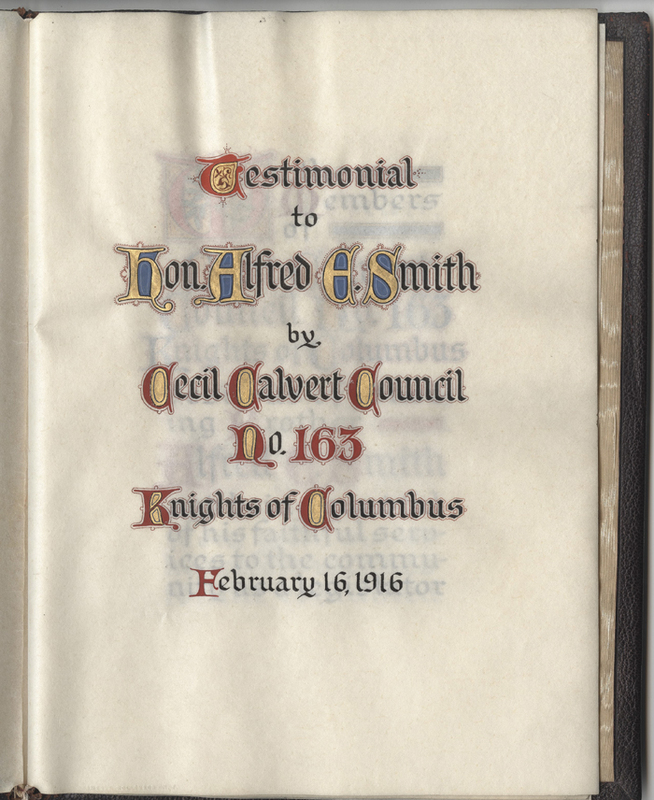 Among other documents attesting to his popularity, from as early as 1916, is a beautifully illustrated testimonial presented to him from the Knights of Columbus celebrating his election as Sheriff of New York County. The City Museum’s Alfred E. Smith papers are a window into the life of a man who, while not quite making it big on the national stage, was an extremely successful and well liked politician in New York City and State. Click here to see more images of objects related to Smith in the collection. This entry was posted on October 1, 2013 by Lindsay Turley in Manuscripts and Ephemera, Photography Collection and tagged 1900s, 1920s, Actors, Albany (N.Y.), Alfred E. Smith (1873-1944), Amateur theatricals, Collections, Empire State Inc., Governors, Knights of Columbus, Lower East Side, Manhattan, New York City, New York State, Presidential Campaigns, Presidential Candidates, St. James Church, Tammany Hall, University of the State of New York.